Welcome to the first in the series of Free E-Book Friday. There are SO many great (and not so great) free e-books available on the internet on subjects that just might interest the Moms Make Money readers. I’ve been collecting just a few recently and although I haven’t yet had time to read them all, I thought it would be a good idea to share, and to create a library of this information here on the site. So you’ll notice a new Category on the right hand side of the site – Free e-books, and you can click here at any time to find the up to date list of books available. All are available in PDF format and you just click the cover to download. Each week, I’ll add a new book and the ‘blurb’. Decide if the book is for you and download or not. All books are shared with the kind consent of the authors. As Online Sales of Products and Services Continue to Excel at a Rapidly Growing Rate, List Building of Targeted Prospects Who Are Visiting Your Site Has Become a Key Element of Success. Imagine having a list of thousands of potential customers who are already interested in your product or service with permission to contact them with new offers. As your list grows, so will your profitability. Don’t let another visitor surf on past your site without capturing their info for another day. Develop and implement a list building strategy to obtain these new high quality prospects for free, watching your customer base rapidly expand! 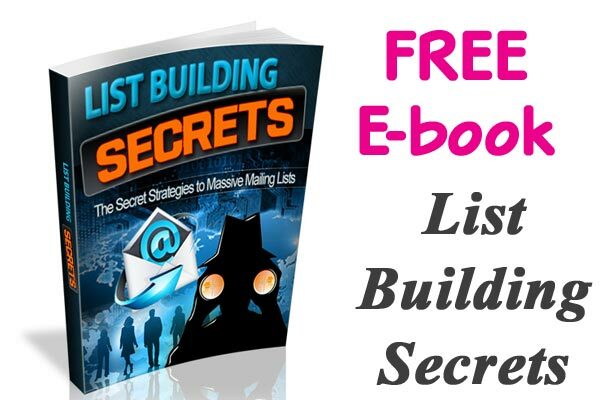 This Powerful Resource of Crucial List Building Secrets Will Reveal all the Right Tools, Strategies and Tactics You Will Need to Build, Segment, Maintain and Monopolize Your List for Maximum Profitability. Please leave feedback – what did you think of this book? What are the best tips?